Polyurethane Stabbing Guides – Pipe Handling Safety! Polyurethane stabbing guides are one of the several urethane products manufactured at Plan Tech with a great degree of precision. Polyurethane stabbing guides are designed to help prevent damage from occurring during makeup. 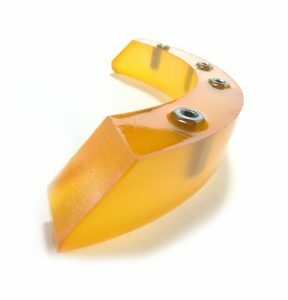 These polyurethane stabbing guides are produced in our state of the art in-house machine shop from first-rate raw material manufactured by the best chemical producers in the industry. With a team of engineers who boast exceptional technical expertise, you can count on us to meet the quantitative and qualitative demands of your stabbing guide project. We have them available in different models or applications such as for casing, tubing and drill pipe. High-quality urethane formulations are used in both short and long production, making us the go-to company for the very best polyurethane stabbing guides. Being made from the best available raw material, our urethane stabbing guides offer superior physical properties that make us one of the leading brands in the industry. As products that help in preventing the occurrence of damage during makeup, then it is common for them to be prone to wear. However, with the combination of first-rate materials, we make use of and the expertise of our engineering team, our rubber stabbing guides rank among those in the industry that excellently resists wear. Are you interested in cast Polyurethane Stabbing Guides? Please Contact us so we can help solve your requirements and work with you on your specific application!